The things we’re willing to do for the love of travel. We’ll stand in line to be searched, scanned and even frisked by Transportation Security Administration representatives. We’ll pay for the privilege of checking a bag or some in-flight entertainment to pass the time in the air. And in this case, we’ll even go to the doctor. Our upcoming safari in Tanzania doesn’t require any vaccinations, officially. The Africa Adventure Company (through which we’ve booked our trip) and the Centers for Disease Control and Prevention (CDC) agree on this point. 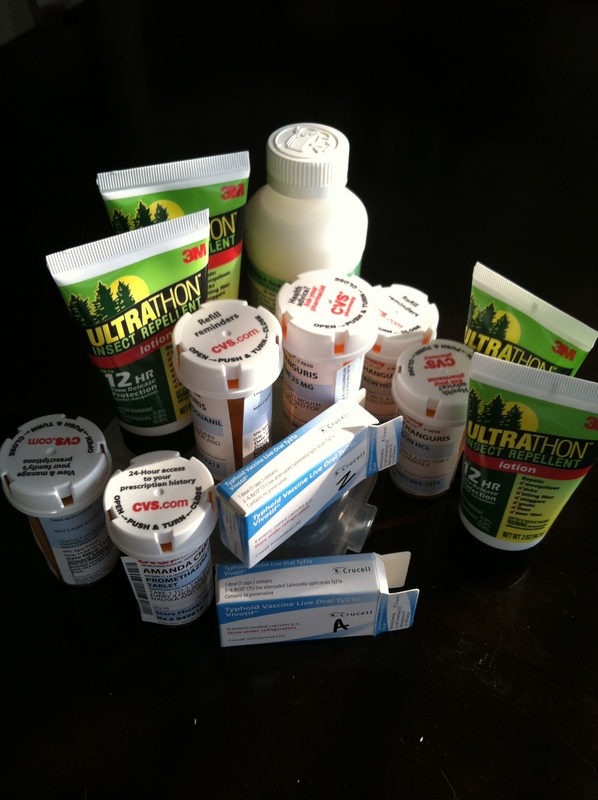 The CDC does recommend a pre-safari trip to a travel medicine clinic at least four to six weeks ahead of departure, so that’s how we found ourselves at FCPA Travel Health Services a couple of weeks ago. Nick Craig, Travel Medicine Specialist, set us straight on which of the “recommended” vaccinations on the CDC’s list were advised for our trip. It’s quite the list, I’m not gonna lie. Zeke shows off his Snoopy band-aids. First, Zeke got up to date on some of the vaccines he missed along the way. He had never been vaccinated for Hepatitis A, for example, because it wasn’t a requirement when he went to college (it was a requirement by the time I started my college career). He also got his flu shot – we’re pretty sure that’s a first for him. 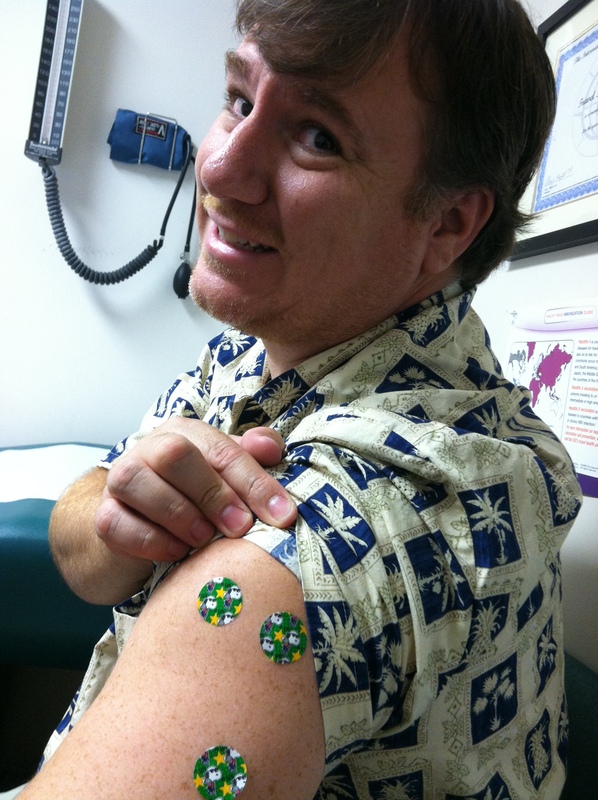 I had already received my flu shot (an annual event for me since I work in a hospital). We both needed a booster dose of the polio vaccine. Craig says we’re set for life now on the polio front. Now the fun part, the typhoid vaccine. This one is administered in pill form, but it’s a complex process. For the vaccine to be effective, you have to take four doses over a seven-day period. Every other day you take a pill, but you have to make sure it’s on an empty stomach (two hours after eating) and you can’t eat for another two hours after you take it. You know how every time you’re kneading dough and your hands are covered in stickiness, your nose starts itching? Same phenomenon here. Every evening we were killing those two hours between dinner and typhoid vaccine time I could only think of all of the stuff I wanted to eat. I wasn’t hungry. I know not eating for a four-hour window is a perfectly normal thing to do, but because I couldn’t grab a snack it’s all I wanted in the world. I know, I’m strange. We got through the process successfully this week, so we’re prepared to fight off typhoid should we encounter it. Next up on the vaccine list is malaria. It’s another one in pill form, but we have to wait until two days before our trip to start taking it. I’m happy it’s marked “take with food” – that’s so much easier! Apparently it’s known to cause some stomach upset, so we also have a prescription for promethazine to relieve nausea – just in case. Craig also prepared us to fight off traveler’s diarrhea. We have prescriptions for Ciprofloxacin, which we’ve been told to start at the first sign of queasiness. If it’s just something not agreeing with our stomachs, fine, but Dr. Craig explained that every 15 minutes you wait to start fighting the bad bacteria will translate into two hours of discomfort. You don’t have to tell me twice. Along with the Ciprofloxacin, we’ll have Pepto Bismol and Immodium caplets to get everything back in balance if something should go awry. Apparently the lions, giraffes, elephants and zebras we’re hoping to see on safari happen to live in an ecosystem chock full of bugs. Not surprising, really, when you think about it. Dr. Craig has thought about it a great deal and set us up with cream for any exposed areas of skin (hands, face, neck) and spray for our clothes. I have a feeling I’m going to be very happy we’re so well prepared with bug repellant. While his office doesn’t participate with any insurance providers, I found out our insurance does cover vaccinations – even those related to travel. Something tells me the paperwork will be more painful than any of the vaccinations.